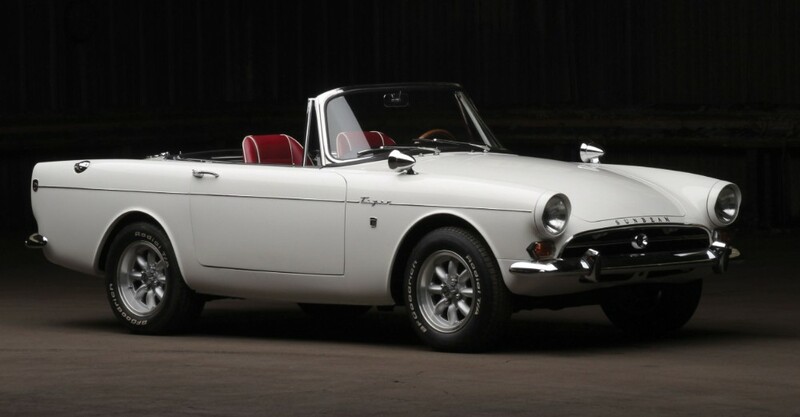 The Sunbeam Tiger was an Anglo-American hybrid. Built in West Bromwich, England, its roots were in Detroit, Michigan. Almost literally - Rootes being the parent company. Until Chrysler took Rootes over, that is. The Sunbeam Tiger was a Sunbeam Alpine - fitted with a Ford V8. Carroll Shelby - he of AC Cobra fame - did early development work on the Tiger. It was then passed to Rootes. The new 4.2-litre engine was hooked up to a 'top loader' 4-speed gearbox. In turn, a more substantial final drive was installed. The body shell, too, was beefed up. But Rootes were becoming over-stretched. They still had the Sunbeam Alpine in production, after all. Riding to Rootes' rescue came Jensen. Their premises were but a stone's throw away from the Rootes factory gates. It fell to them to complete the Tiger project. The Sunbeam Tiger's power output was 164bhp. Top speed stood at 117mph. 0-60 came up in 9.5s. Torque from the Ford V8 was plentiful, to say the least. Extra care was required in transferring it to the tarmac - since steering and suspension were suspect. Ultimately, though, the Tiger was good value for money. Americans bought it in their droves. British buyers had to wait a year to do the same. Everything looked good for the Sunbeam Tiger. Until Chrysler's buy-out of Rootes, that is. The Chrysler top brass took an immediate dislike to the Tiger's V8 motor - mainly, because it was made by Ford! Which would have been okay, had there been a Chrysler V8 to replace it. Actually, there was - but it did not fit! Which was the writing on the wall for the Tiger. Thankfully, Rootes had already built 571 MkII Tigers - complete with a 4.7-litre Mustang motor. One of the highest compliments that can be paid to the Sunbeam Tiger is that it is spoken of in the same breath as Carroll Shelby's AC Cobra. Cars that bear that kind of comparison are thin on the ground, indeed!